Good evening, and welcome to the Chinese Embassy! It gives me great pleasure to co-host this reception with Vice Minister He Jianzhong from the Ministry of Transport of China to mark the opening of the 30th Assembly of the International Maritime Organization (IMO). 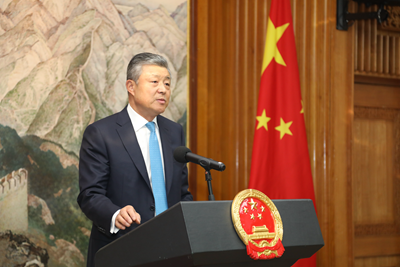 Let me first of all express my appreciation to each and everyone present this evening for the support you have given to China in maritime affairs. A month ago, the 19th National Congress of the Communist Party of China was successfully concluded. This Congress has started a new era of building socialism with Chinese characteristics. It has outlined the blueprint for China's future development. 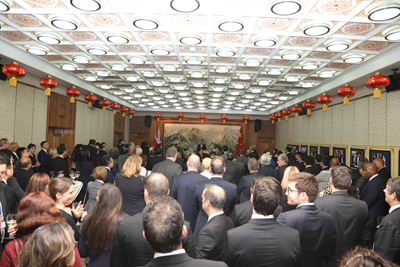 It has also highlighted China's commitment to making greater contribution to world peace and prosperity. I am convinced that this Congress will have a significant and far-reaching impact on China's cooperation with the IMO, on the international shipping industry, and on global maritime governance. First, China has been and will continue to be a contributor to the development of the IMO. Over the years, China has been an active supporter and participant of IMO activities. China's cooperation with the IMO has become more substantial, more diverse and more effective. As a member state under category A for 28 consecutive years, China has worked actively for the IMO's effective operation worldwide. China has ratified almost all of the treaties under the IMO framework. We are now a party to more than 40 major international conventions and protocols. The Chinese government has adopted a series of legislative, administrative and other enforcement measures to ensure the effective application of IMO legal instruments in China. China regards its development as closely linked with the growth of fellow developing countries. The development of one cannot be sustainable without the development of all. So, China always values and supports IMO technical assistance to the developing world. In recent years, we focused our efforts on capacity building in developing countries. We donated to the World Maritime University and the Integrated Technical Cooperation Programme Fund. And we contributed to the West and Central Africa Maritime Security Trust Fund. A recent example is the Maritime Technology Cooperation Centre-Asia. This was established in Shanghai last May under the authorization of the IMO. This Centre serves as a new platform for the application and cooperation of international maritime technologies. It also signifies the increasingly substantial and pragmatic cooperation between China and the IMO. 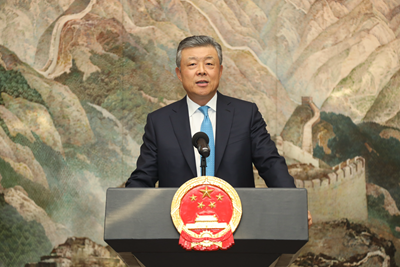 Going forward, China will continue to deepen cooperation with the IMO. We will launch a series of programmes in China that focus on maritime technology cooperation and exchange. We will increase input of resource factors and strengthen research and development mechanism. This will enable us to provide better hardware and infrastructure for the IMO technology cooperation platforms. In turn, this will encourage innovation in our cooperation to make it more sustainable. Second, China has been and will continue to be a powerhouse for the international shipping industry. The global economy relies on international merchant fleets. So the shipping industry becomes an important pillar for world economic growth. Since returning to the IMO family in 1973, China has seen its shipping sector grow by leaps and bounds. That at the same time has given the global shipping industry a strong boost. As of the end of November 2016, China had the world's third largest fleet, and ranked the 8th among the states of registry. By the end of 2016, China had 2,317 berths with capacity of more than 10,000 tons. That was a 30% increase in five years. And 34 of them have the capacity to anchor 100 million-ton vessels. In terms of freight volume and container units, China has been No. 1 in the world for over ten consecutive years. And seven of the world's top ten ports in freight and container capacity are in China. Now, China's ports are directly connected with more than 600 major ports in over 200 countries and regions. Thank to this, over 90% of China's freight trade with the world pass through these ports. Moreover, more than 600,000 well-trained Chinese seafarers have manned all types of Chinese and foreign ships. It is fair to say that the booming Chinese shipping industry is an important contribution to the international shipping industry as well as global trade and world economic growth. In the next five years, China will import $8 trillion worth of goods, attract over $600 billion foreign investment and make $750 billion outbound investment. The steady growth of China's foreign trade and two-way investment is good news to the world economy and trade. It is also good news to the international shipping industry. And breakthroughs in the application of smart technologies and management of pollutant discharge from ships. With the achievements of these goals, China will have contributed to a greener, safer and more sustainable international shipping industry. Third, China will create opportunities for greater maritime connectivity. The Belt and Road Initiative represents a major effort of China to open up in all fronts. It serves as an important public good that China offers to the world. This Initiative also represents a major trend in economic globalization and trade liberalization. It will create new opportunities for greater maritime connectivity and deeper international shipping cooperation. Large infrastructure programmes including Gwadar Port and Piraeus Port are making good progress. More large projects are in the pipeline. China has signed and implemented bilateral sea and river transportation agreements with 36 countries along the route, the EU and ASEAN respectively. Thanks to China's efforts, the China-CEEC Secretariat for Maritime Issues has been set up. This will enable closer cooperation between China and countries of Central and Eastern Europe on maritime affairs. Between China and ASEAN, we have now set up the Maritime Consultation Mechanism and the Port Development and Cooperation Forum. Last September, I attended the breakfast meeting of the Third London International Shipping Week. It was widely recognized at the meeting that, besides offering greater prospects for cooperation in infrastructure, trade, finance, law and insurance, the Belt and Road Initiative also creates favorable conditions for the international shipping industry to transform and to upgrade. Several months ago, the Chinese government issued the Vision for Maritime Cooperation under the Belt and Road Initiative. In the document, China proposed to work with other countries to build "three blue economic passages" supported by the coastal economic belt in China. The first one links China, Indian Ocean, Africa and the Mediterranean Sea; the second one connects China, Oceania and the South Pacific; and the third one connects China and Europe via the Arctic Ocean. Going forward, China will continue to enhance policy coordination with countries along the Belt and Road. We seek to join hand to develop the "blue" economy and achieve prosperity while protecting the marine environment. China will also engage national governments, international organizations, civil societies and business communities on demonstration projects for preserving marine eco-system and for tackling the implication of climate change on maritime industries. Fourth, China will offer its wisdom to global maritime governance. Given the new international landscape and new trend of today, it is apparent that many existing governance concepts, systems and models need to adapt. The question is how. Ocean offers a solution to the sustainable development of mankind. Ocean also serves as a bond connecting the countries of the world. It is where countries can enhance exchanges and engage in mutually-beneficial cooperation. China has a long coast line. China embraces the ocean. The ocean holds the key to the economic prosperity, and prosperity should be shared by all nations. The ocean also holds the key to the future of mankind and we should protect and coexist with the ocean. On global governance, China believes in extensive consultation, joint contribution and shared interest. China will take an active part in global maritime governance. We seek to build win-win partnership on maritime affairs. And we believe that the benefit that ocean brings should be shared by all nations. And deepen mutually-beneficial cooperation with other countries to protect ocean environment, promote innovation and application of maritime science and technology, share maritime public goods and safeguard maritime security. The ocean is vast, but we have got favourable wind in our sail. As a devoted IMO member, China is ready to join hands with other member states and stay true to the principle of safety, environmental protection, efficiency and sustainable development. Together, we can build a brighter future for international maritime cooperation.